Please use the 'Book Now' button above to make a booking enquiry, or call 01984 618274 ext 1. Once you have made your booking and paid a deposit please complete the Participant Info Form, thank you! Please note these prices are correct; prices listed in the season brochure are not. Fees are slightly higher than our standard weekends due to the extended duration of this course. An extended weekend course for musicians to develop ensemble playing skills and make imaginative arrangements that are exciting to listen or dance to. We’ll be using music from European folk/traditional/popular music traditions as the raw material to make new arrangements that can go in any direction. The aim is to explore and combine all sorts of influences and ideas to make spine tingling music that is more than the sum of the parts. The course is fairly intensive and includes all day ensemble workshop sessions with the aim of performing all the pieces we create together at a public concert on the Sunday night. 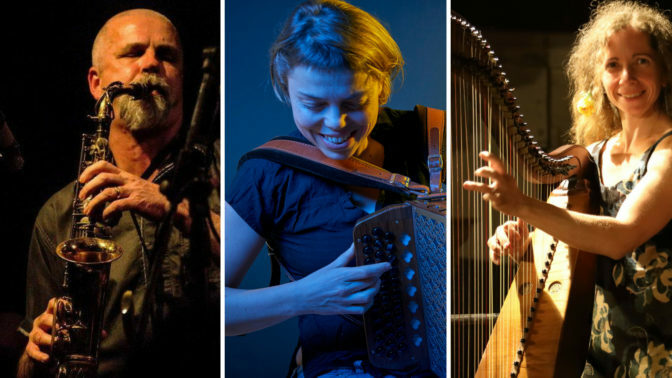 The course is led by musician/composer/arranger Paul James – saxophones, border bagpipes (Blowzabella, Evening Star), Belgian diatonic accordion virtuoso and composer/arranger Anne Niepold and we are delighted to welcome German harpist, composer and teacher Merit Zloch to the team for the first time this year. Arrive at 12 noon Friday for lunch at 1pm; depart after lunch on Monday. A detailed programme will be sent out in advance. The participants will be divided into three ensemble groups and each group will work with all 3 tutors throughout the course. There will be at least one piece of music that involves everyone playing together as one ensemble. Friday: Arrive from 12noon. Lunch 1pm. Introductions, what’s happening, questions. Ensemble workshops. Dinner 6:30pm. Informal music making in the bar. Saturday: Early morning guided walk in the Quantocks for those who want to. Breakfast 8:30am. Ensemble workshops 10am – 5:30pm. Lunch 1pm. Dinner 6:30pm. Evening trip to the award winning Pebbles Cider Tavern in Watchet or free time to relax. Sunday: Breakfast 8:30am. Ensemble workshops 10am – 5:30pm. Lunch 1pm. Dinner 6pm. CONCERT 8pm (course leaders and ensemble groups) followed by informal music making in the bar. Monday: Early morning guided walk in the Quantocks for those who want to. Breakfast 8:30am. Workshops 10am – 12:30. Lunch 1pm. Finish. This is an advanced/intermediate level course suitable for musicians of all ages (including 16-18 year olds), any instrument (acoustic, electric, ancient, modern) from any musical background (folk, jazz, rock, classical, early music). You’ll need to be able to read music or play well by ear. If you play more than one instrument we advise you to bring it/them as this will help you to get the most from the course in terms of playing easily in different keys/modes, and also to be able to contribute in a way that is sympathetic to the style of the piece (bagpipes don’t sound great on everything!). During the course we will provide any music manuscript you need (including for any transposing instruments – please let us know your needs on the Participant Info Form – please complete this once you have booked your place and paid a deposit). To get the most from this course you don’t need to be the greatest musician. You do need to be able to play confidently and be positive, flexible minded and a team player prepared to try things outside your comfort zone – and have the energy for quite long intensive days of music making. You will be in safe hands with a very experienced tutor team in a mutually supportive atmosphere. We’ll have a lot of fun too with time for relaxation and informal music making. If you have any queries about the course, have a chat with course leader Paul James 0788 794 8853 pauljames.eu@gmail.com. Any queries about food, accommodation and how to get there, follow the Your Visit link above or phone 01984 618274 ext 1. When you have booked and paid a deposit please tell us a bit about yourself and your musical needs (for example, music needed for transposing instruments) on the Participant Info Form. She has played in bands almost as long as she has played the harp and is constantly fascinated by the interplay between musicians. She likes to arrange und develop pieces together with her band colleagues and to improvise. Ein 3-tägiger Intensivkurs für 16- bis 116-jährige Musiker. Ausgehend von europäischer traditioneller Musik können die Teilnehmer ihre Fähigkeit ausbauen, Stücke zu arrangieren und im Ensemble zu spielen und sie erarbeiten phantasievolle, ungewöhnliche und zeitgemäße Arrangements, die Lust zum Tanzen machen. Workshops, Diskussionen, Proben, Aufführungen – und Spaß mit Musikern unterschiedlicher Herkunft. Stage intensif de 3 jours pour musiciens de 16 à 116 ans. A travers l’étude de musiques inspirées des musiques traditionnelles européennes, vous développerez des arrangements et jouerez en ensemble pour faire danser sur une musique innovante, inhabituelle et contemporaine. Stages, conférences, répétitions, restitutions sont au programmes de ces journées ainsi que le plaisir partagé de jouer avec des musiciens de toutes origines. Un corso intensivo di 3 giorni per musicisti di età compresa tra i 16 e i 116 anni. Utilizzando musica ispirata alle tradizioni popolari europee potrai sviluppare le tue idee e le tue abilità strumentali e di insieme per dar vita a nuovi, creativi ed inusuali arrangiamenti per far ballare la gente. Workshops, conferenze, prove, spettacoli e divertimento con musicisti di differente estrazione e provenienza. Curso intensivo de 3 días para músicos de edades comprendidas entre 16 y 116 años. Utilizando música tradicional europea para desarrollar arreglos imaginativos, originales y contemporáneos para la danza y el baile. Talleres, charlas, ensayos, actuaciones con músicos de diferentes procedencias. Een intensieve 3 daagse cursus voor muzikanten van 16 tot 116 jaar oud. Europese folk- en volksmuziek dient als basis om eigen interpretaties en bewerkingen te creëren. De melodieën die (nieuw…) gecreëerd worden nodigen uit om te dansen. De cursus bestaat uit repetities, workshops, overlegmomenten en optredens. Uiteraard is deze cursus een boeiende ontdekkingsreis in de cultuur en achtergrond van iedere individuele muzikant.